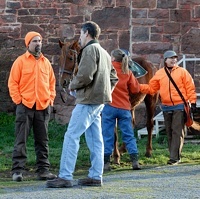 A lovely April morning for an all-breed hunt test at Strawberry Hill Farm outside Thurmont, Maryland. Some milling around the horse barn and chatting as folks get ready. Judges, Marshal, Bird Planters - they've all got things to talk about before the first brace gets under way. 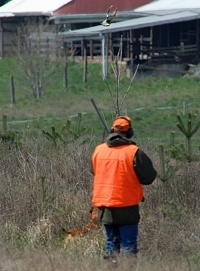 On any farm where thousands of game birds are released, the local fox population tends to jump much too high. But controlling them doesn't mean wasting pefectly good pelts . . . And here, some are drying in the barn. It's a nice chance to check out the farm's classic old structures, and get to know some classic new friends. Vizla Xing, indeed. Strawberry Hill is home to many. The marshal accompanies two handlers down to the breakaway area, where the judges will meet them. A Shorthair in the first brace has some time to kill before the judges arrive, and he's looking out over the back course. Yeah, maybe he can smell the birds from here. How do you get this sort of focus from the dog? Take your camera, and get in between the dog and the birds. 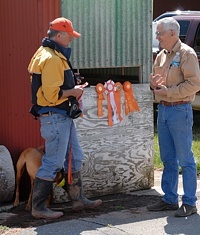 A quick word between handlers, the marshal, a judge, and the AKC rep visiting the event. 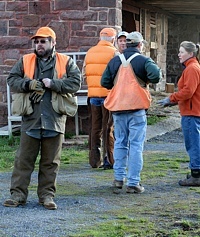 A Pointer is locked up on a chukar, and waits as gunners move into place. And the pointer's bracemate is swinging around the other side of the bird field, on his own hunt. While their dogs are working, the brace's two handlers stroll into the bird field. These are master-level dogs, and can be trusted to be patient. 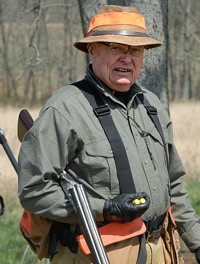 Handlers carry prop guns, as well as blank pistols for use over birds flushing on the back course. Her staunch dog staying on point, this handler and a gunner give the dog some room, and walk around to prepare for the flush and retrieve. On the brace's second bird, the shorthair's handler has just kicked up the partridge in front of his watching dog. The gunners take aim as the handler raises his non-functioning prop gun. That's part of the test - to make sure your dog is steady, even as you swing your own gun. Fairly close quarters, on this one. The pointer is patient as the team flushes and hits the bird. It's a busy brace. 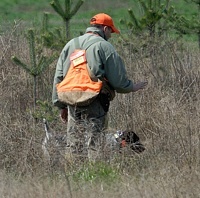 Working another bird, the GSP's handler marches in for the flush while the Pointer honors. Honoring the other dog includes watching patiently as the other dog runs right past with a bird on a retrieve. Bringing the bird on home. 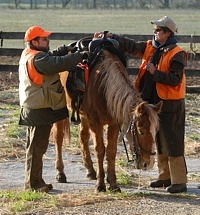 Coming up off of the back course, the judges (one on a radio to let the marshal know they're entering the bird field) accompany a handler. The back course is way down yonder, through the trees. Another brace works its way towards the bird field. Jim and the Weim he's handling head down the slope into the bird field. 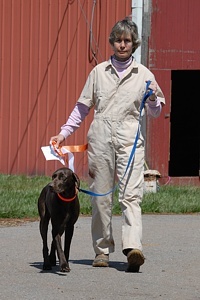 In a senior test, judges will allow a handler to collar a dog once it has acknowledged another dog on point. As a judge and gunner watch, the handler works out in front of the pointing Weim to kick up the bird. Rats. The chukar has just flushed right over the dog's head, between the gunner, and right at the mounted judges. No safe shot. . .
. . . and the judge nearest the going-away bird naturally lowers her head, but the gunners have long since decided to pull the shot. If there are too many unproductive flushes out of the bird field, the judges may call for another bird to be planted. A sporting bystander jog the bird bag out from the gallery. A steadying 'whoa' from Jim as the gunner neatly drops a partridge for the retrieve. Off of the testing grounds, in an idle agility enclosure, a couple of Vizslas get some romp time. Agility smagility. This is off-duty time, and the poles are just scenery. Just some high-speed goof-off time. Vizsla and handler cresting the hill, and headed into the bird field on the Senior course. A German Wirehair bounds into the bird zone. Doesn't skip a beat, even with a hot tongue, and follows the scent wafting up from the piney area downhill, where earlier birds were worked. A chukar goes up in front of a Vizsla, and breaks for the barn. A quiet caution for high-pressure, up-close point. Gunner One. He's an over/under man. Gunner Two. He's a side-by-side man. Two judges, riding in, and discussing what they've seen on the back course. It's getting warm out, but scenting is still possible for Canon, a shorthair who's charging into the bird field after a clean run through the back course. The handlers walk in behind. Working at comfortable gun range. 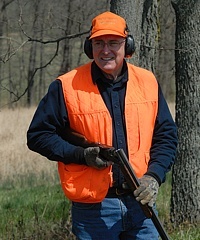 But in a senior test, handlers do not need to carry a prop gun - only a blank pistol. A looping drive-by. But they're each working . . .
. . . their own way. It's a virtual vortex of Vizslas. Waiting up at the farm's office is a box of the AKC's recognition for those pointing dogs that exhibit what the judges are looking for. Speaking of which - a nice haul for this handler. And a nice job by this lovely solid-liver shorthair girl, too.